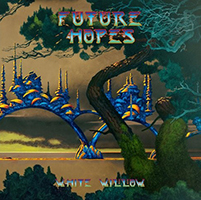 On March 31st the American label The Laser's Edge will release the seventh studio album “Future Hopes” of the Norwegian band White Willow. The fans had to wait six years for the successor of “Terminal Twilight”. But in the meantime the band came with remasters of the albums “Ignis Fatuus”, “Ex Tenebris”, “Storm Season” and “Sacrament”. And leader Jacob Holm-Lupo surprised us with the Project The Opium Cartel. The singer of that project, Venke Knutson is now the new White Willow singer. The rest of the line-up is the same as on the “Terminal Twilight” album. “Future Hopes” is housed in a beautiful digipak with artwork of legend Roger Dean. The mix was done by Christian Engfelt and another legend Bob Katz took care of the mastering of this album. “Future Hopes” is a kind of sequel to the other two conceptual albums, “Terminal Twilight” and “Storm Season”. Jacob Holm-Lupo explains the science fiction concept with the words “love among the ruins”. In the accompanying information sheet the band is presented as an art-rock band which means that the band makes pop songs that are stretched to pointless lengths and crammed with weird sounding instruments. And the quote that a White Willow album must contain the constants: chiming guitar chords, Mellotrons and songs about sad people. I don't know if Art rock is the right label for the band. But what I am sure of is that the band is making highly original music. The debut album “Ignus Fatuus” had some folk influences and I remember that at that time the album made quite an impression in the progressive rock world. Later on the symphonic rock was more influenced by heavier sounds. But for me White Willow was always one of those great progressive rock bands from the Northern parts of Europe who's music had always a melancholic ingredient. So maybe it is true, songs about sad people. Or has it something to do with the amount of light in those Northern parts of Europe. But in any case I just love that side of the music, and yes I love those Mellotrons. The album opens with mysterious synths (CS80V) in opener “Future Hopes”. The melancholic sounds and sad lyrics are making a nice contrast with the fairy tale like voice of singer Venke Knutson. She is shinning in the following track “Silver & Gold”. The song has a more lighter atmosphere with beautiful chiming guitar chords. After this the atmosphere of the album becomes more darker in the track “In Dim Days”. An eleven minutes long progressive rock song with a diversity of keyboards and nice drum and guitar parts. The lead guitar part is played by guest Hedvig Mollestad. You can hear a lot of keyboards and synths in this piece, but this counts for the whole album. It is great to hear the sounds of Instruments like the Yamaha CS80, Mellotron, Hammond organ, Wurlitzer and various synths. And if this is not enough you can also hear the flute and an EWI wind controller. Menacing keyboard sounds in contrast with the angelic voice of Venke Knutson. The short and dark “Where There Was Sea There Is Abyss” is made up of guitar, Mellotron and reverberated noise and seamlessly flows into the big epic and highlight of the album “A Scarred View”. The first synth part with the CS80 reminds me of the work of U.K. Keyboardist Eddie Jobson. This track is bliss for keyboard lovers. Besides the already mentioned CS80 and the Mellotron you can hear the sounds of the mini- Moog, Arp pro-soloist, Arp solina and Prophet 5. You can hear beautiful melodies in this track. My highlight is the part in which the band gives an ode to the “Wind & Wuthering” album of Genesis. “A Scarred View” is the highlight of the album for me. Only for this intriguing composition you have to buy this album. The album comes to an end with two bonus tracks. The first one is called “Animal Magnetism” and I think this must be a Scorpions cover. Guest David Krakauer is playing a freaky clarinet solo in this track. In the second bonus track keyboardist Lars Fredrik Froislie plays his own composition “Damnation Valley”. The piano is the main instrument but he also uses several synths and the Mellotron. A worthy ending of a remarkable album. The main role of this album is played by the many keyboards and synths. The seventh studio album of White Willow can be divided into three parts. The first part with the first two short vocal based songs with a somewhat lighter atmosphere than the rest of the album. The third part are the two bonus tracks. And the second part, the heart of the album with the darker and longer tracks “In Dim Days”, “A Scarred View” and the inclosed short intermezzo “Where There Was Sea There Is Abyss”. This hart of the album is also the strongest part of the album with my personal highlights “A Scarred View” and “In Dim Days”. “Future Hope”s is an album that only reveals it's real beauty and little details after several listening sessions. This counts especially for the epic “A Scarred View”. And with singer Venke Knutson the band is presenting again a wonderful and talented singer. If you like the keyboards and synth sounds of the seventies this album is a must for you. But at the same time the music sounds new and fresh. Highly recommended by progVisions.